PARIS --- The United Kingdom’s decision to withdraw from the European Union could well reinforce its bilateral defense ties with France, which have been substantially developed in recent years independently of both NATO and the European Union. While it is impossible to guess how the Brexit process will play out, given the lack of precedents and the European Union’s near-irrelevance in the field of defense, it is logical to assume that London will wish to develop and perhaps extend its bilateral Lancaster House Treaties with France, whose military and industrial ties go well beyond those the UK has with any other European country. The two countries also share a strong streak of national individualism, as the UK’s Brexit is motivated by much the same mindset that caused France to pull out of NATO’s integrated military structure in 1966: the refusal to submit national interests to collective decisions. Much as France refused to see its troops automatically dragged into a war simply because it belonged to NATO, the UK – after having waited 30 years -- on June 23 finally refused to bend further under economic and social rules it did not wish nor approve, simply by virtue of its EU membership. Interestingly, and although it maintains close defense and intelligence ties to Australia, Canada, New Zealand and the United States, both bilaterally and through their Five Eyes Powers Defence Agreement, the United Kingdom has no such defense ties within Europe, apart obviously from its membership of NATO, which despite 50 years of fruitless attempts to replace it with a European structure remains the cornerstone of European security. But in the field of defense, the future UK government will have a to make a fundamental choice: becoming the 51st American state, an unsinkable US aircraft carrier anchored off Europe, or, while remaining a full member of NATO, continuing to strengthen its defense ties with France. 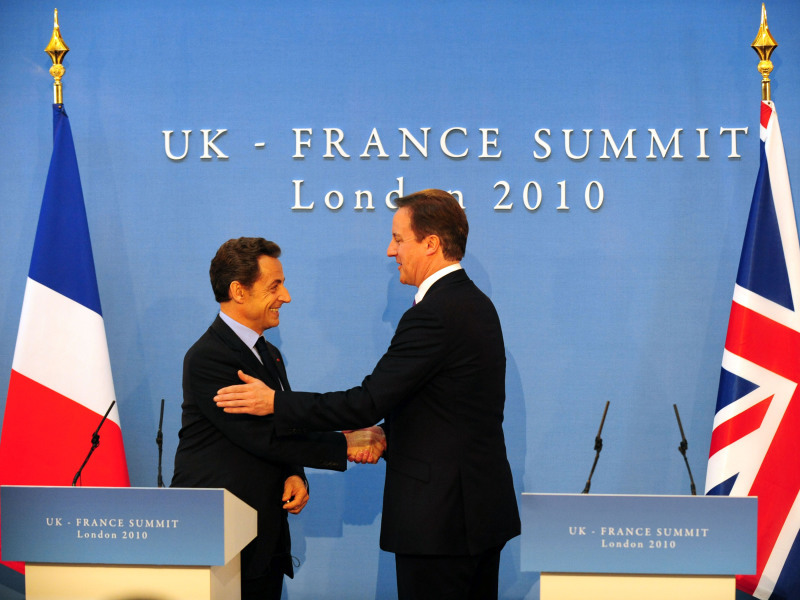 Following on to the St. Malo agreements, which promised much in the naval field but fell by the wayside when UK Prime Minister Tony Blair was unseated, the Lancaster House Treaties, signed in 2010 by Prime Minister David Cameron and former French President Nicolas Sarkozy, expanded bilateral cooperation to include, for the first time, the concept of mutual interdependence in the field of armaments. This means the two countries have begun to pool their know-how and funding to jointly develop equipment and capabilities, each agreeing to give up what the other does better, thereby reducing duplication and costs but thereby becoming dependent on the other. This process is most advanced in the field of missiles, where the two countries are jointly developing joint centers of excellence based on missiles house MBDA. Most significantly, the Defence and Security Cooperation Treaty signed on Nov. 2, 2010 at Lancaster House in London, is entirely independent of the European Union’s Common Security and Defence Policy, and involves neither the European Defence Agency nor the EU Lisbon Treaty’s Permanent Structured Cooperation initiative. It is strictly a bilateral affair, which takes new relevance after June 23 because it is not legally affected by Brexit unless the two governments decide otherwise. This is most unlikely given the bilateral projects they have launched jointly both in the field of armaments (FCAS combat drone, Sea Venom lightweight anti-ship missile, Future Cruise/Anti-Ship Weapon (FC/ASW) stealthy cruise missile, and unmanned Maritime Mine Counter Measures) and for joint military capabilities, such as the new Combined Joint Expeditionary Force which was validated after Exercise Griffin Strike was completed in April of this year. The full extent of Anglo-French defense cooperation is not always clear, as many of its components are presented as stand-alone projects. In January 2014, the French Embassy in London published a detailed list of bilateral defense projects and agreements which illustrates their breadth. The two countries have also started to cooperate in the field of nuclear weapons, which is without a doubt the closest-held of all military secrets. This shared intimacy is helped, of course, by the fact that France and the UK are Europe’s only nuclear powers, as well as being the only NATO nuclear powers apart from the United States. Given all the bilateral defense cooperation initiatives outlined above -- most if not all of them bilateral -- there is little reason to think that Brexit will change anything of consequence. And any possible administrative difficulty caused by the UK’s withdrawal from the EU can be easily resolved by bilateral agreements that, thanks to the two countries’ shared border, do not require assent of any third party. This is the unexpected silver lining in the Brexit cloud: Britain’s long-standing aloofness from the EU means there are fewer ties to resolve, and this is especially true in the field of defense. Ironically, the consequences of Brexit on the aerospace and defense industry could well be felt more acutely in Germany and Italy than in the UK. The initial reaction by the UK aerospace and defense industry to Brexit was extraordinarily muted for an industrial sector that generates £65 billion in annual sales, directly employs 340,000 people and says its exports are worth £35 billion per annum, according to its trade association, ASD Group. While it’s too early to evaluate Brexit’s effects on UK industry, the “Leave” vote could well have some salutary effects, such as for example persuade the British government to hold off on awarding Boeing the overdue £2 billion contract to produce new AH-64 Apache attack helicopters. After the June 23 vote, the Ministry of Defence may hesitate to take away that business from what was AgustaWestland – and is now Leonardo-Finmeccanica’s helicopter division—because in the post-Brexit world the company might find it difficult to survive if major domestic orders go overseas. Brexit could also have a second silver lining: it will force European governments to decide which cooperative ventures to launch with the UK, which to pursue and which to drop, something they had been reluctant to do before the June 23 vote. Bilateral cooperation on the Future Combat Air System, the next-generation combat drone project with France, has been in suspended animation since last year because of the uncertainty caused by the Brexit referendum. Multilateral programs in which the UK is involved will probably escape implosion, simply because they are too important to the other partners, who will not want to risk upsetting them. Airbus, for example, designs and produces wings for most of its aircraft in Wales, so there is little chance that France and Germany would allow the EU bureaucracy, or indeed any other EU membe, to mess with the company’s economic impact, best illustrated by its order backlog of over €1,000 billion, its workforce of 136,000 employees and its annual revenues of over €64 billion. “Airbus urged Britain on Friday to remain competitive for industrial investments after it voted to leave the European Union, as aerospace experts warned it could no longer take for granted a strategic position inside the European planemaker,” Reuters reported June 24, quoting Airbus Group Chief Executive Tom Enders as saying that "The world will not stand still, nor will Europe… Of course we will review our UK investment strategy, (as) everybody else will." That remains to be seen. The Broughton and Filton factory which design and produce wings for all Airbus aircraft now belong to Airbus itself, so unless Airbus keeps them competitive – which will cost less, thanks to sterling’s depreciation – it would require a massive investment to close it down and rebuild it elsewhere, while causing a huge disruption in Airbus deliveries, either of which the company can ill afford. The post-Brexit problem will probably be trickier for Leonardo-Finmeccanica. In addition to its 25% stake in MBDA, which Leonardo CEO Mauro Moretti has suggested several times he might be willing to sell, the Italian group owns the helicopter factory at Yeovil (the former AgustaWestland) as well as 27 other industrial sites employing over 7,300 people. These include plants formerly owned by Selex, and which make such cutting-edge products as AESA radars for combat aircraft – including the four-nation Eurofighter and Sweden’s Gripen E – as well as electronic countermeasures, IR Scan & Track (again, including for Eurofighter and Gripen) and other advanced defense electronics products. UK-Italian defense industry links were predominantly based on economic grounds, and are not covered by any substantive body of inter-government agreements, so the scope for bureaucratic meddling and EU interference is greater than for Anglo-French cooperative ventures. But, again, there is no obvious reason for the British and Italian governments to do anything to disrupt their industries’ business. Much as for Airbus, it is difficult to imagine the UK’s partners in the Eurofighter program -- Germany, Italy and Spain – taking any steps that could weaken it, especially just as it finalizes the development of its most advanced version, that aims to keep it competitive into the late 2020s. But Marwan Lahoud, Chief Strategy and Marketing Officer at Airbus Group, and current Chairman of the French aerospace industries’ group, GIFAS, thinks that Brexit could end defense cooperation between the UK and European Union countries, and highlighted the risk of a return to customs tariffs and other administrative barriers. Again, the Brexit vote opened a period of uncertainty, in the field of defense and of defense and aerospace manufacturing as in many others. It will take time for the Brexit procedures to be defined, implemented and finalized. Yet, unless both the UK and EU decide to cut off their noses to spite their faces – a process the EU’s ineffable Jean-Claude Juncker immediately tried to kick-start on June 24 – there is a good chance that, at least in the defense industrial field, Brexit’s consequences will be limited to manageable administrative problems that can be resolved with a dash of good will and a dose of Russian blustering to grease the process. And not least because many other European countries are already clamoring for a referendum of their own on EU membership -- few European governments will be reckless enough to risk their own survival by taking a hardline position to “punish” the United Kingdom. -- June 29: corrected spelling mistake in subtitle (Whither Leonardo?). H/T reader FT.